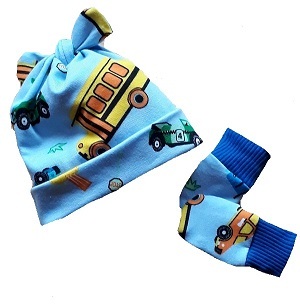 smallest prem baby clothes and accessories sold here, trendy premature babies knot hat with mittens to match.really soft 100% cotton stretch fabric,nice and roomy and keeps your baby boys head warm adding a splash of fun colours to add to his first wardrobe. click on the ORDER button below to order this style new colours just added for 5lb babies. hand made in uk by Nanny nicu TM.